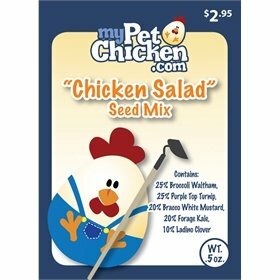 Q: How can I tell if my juvenile bird is a rooster? 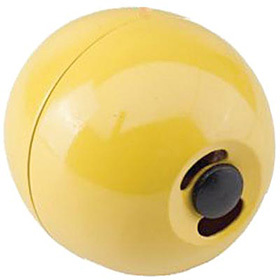 Comb size and redness can be one indicator, but is not usually reliable. In fact, it's one of the worst indicators you can use, as comb size varies by breed and even individual. For instance, one of my hens has a larger comb than any of her sisters of the same breed, and a larger comb than any of my roosters, too. When sexing most juveniles, the best, most fail-safe method is to look at the saddle feathers in front of the tail when the bird is about 3 months old. 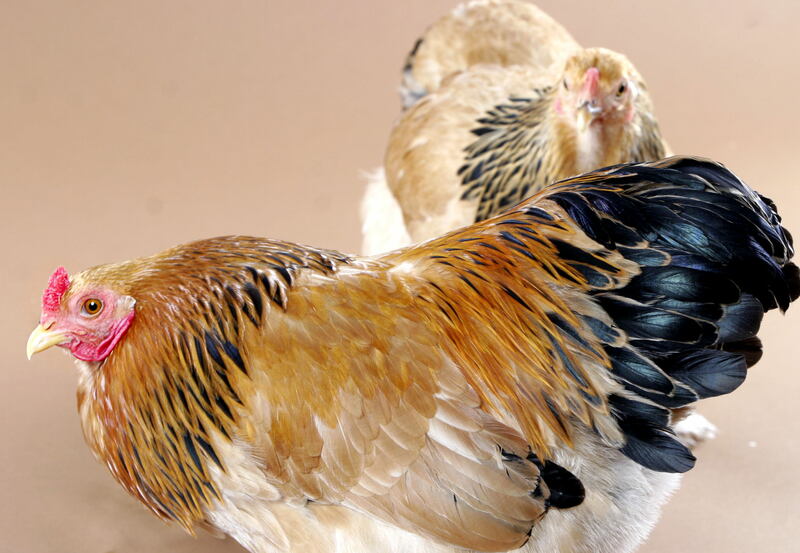 By that age, cockerels will have long and pointy saddle feathers, while a hen's will be rounded. 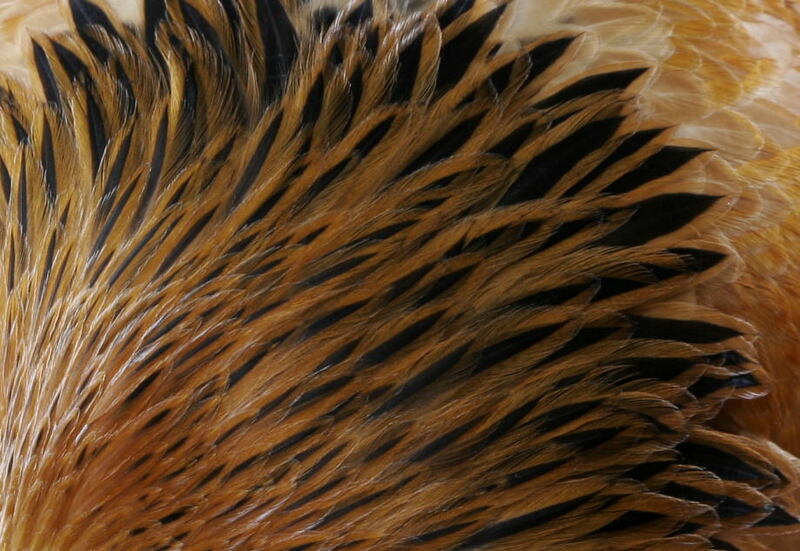 Take a look at this rooster's saddle feathers. See how long and skinny and pointy they are? Those saddle feathers start coming in at about 3 months. (The shiny, black, curving feathers are the sickle feathers that appear a bit later and can get quite long in some breeds.) 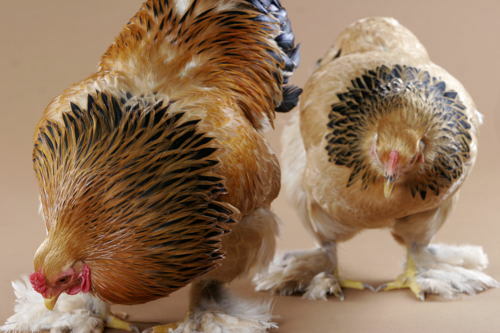 Hens just don't have those skinny saddle feathers in front of their tails--their feathers are more rounded--and they don't have long, skinny sickle feathers, either. 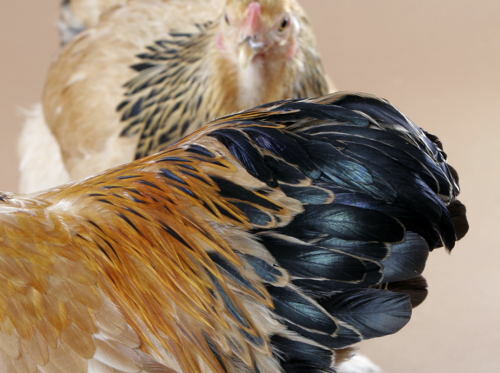 The hackle feathers, or the feathers around the neck, are different in hens and roosters, too. Again, rooster hackles are longer and pointier. How else can you tell? Crowing is a fairly good indicator, but isn't fail-safe, either, because some hens do crow. Plus, generally speaking, you will be able to tell by feathers much earlier since roosters don't usually begin to crow until they are 4 or 5 months old. However, we have had roosters wait until a little later, and begin a little sooner, too. 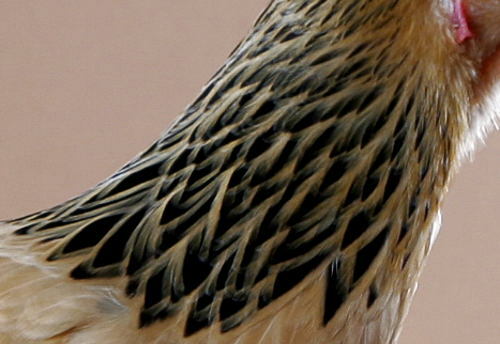 To reiterate, the BEST way to tell for sure is by looking at physical characteristics that cannot be mistaken, so check feather shape when your birds are about 3 months old, as other indications are not reliable. 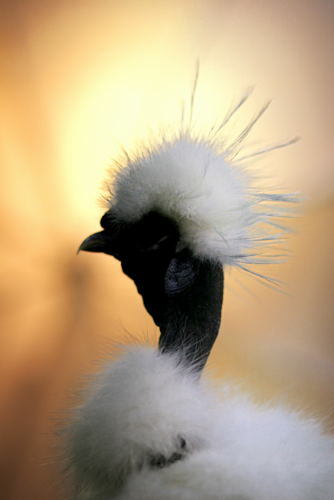 Generally the puffy crests on the hens' heads are rounder, while the roosters may have long streamers coming from theirs. Sometimes males will have slightly shinier feathers. 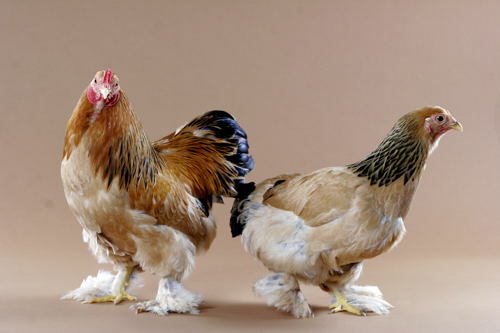 If you have more than one rooster, they may "chest bump" and assert themselves with each other. However, hens will do this, too---just not as often. 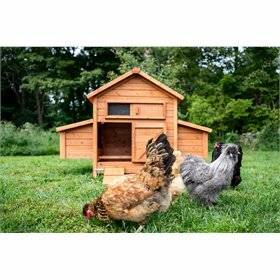 If you have mixed hens and roosters, the roosters usually begin to grow larger more quickly than the hens, so hens may be slightly smaller after a few weeks. Please read the related questions below for further information about sexing chickens. And remember, if you do get an unexpected rooster and you're worried about the crowing bothering your neighbors, consider the no-crow rooster collar.